Beauty translates across all cultural boundaries. We visited the Fenimore Art Museum in Cooperstown this past Thursday, to tour the facility and get a better view of the space where my work will be hung in an exhibition that opens in August of 2012. I will write more about that in the upcoming days but I feel compelled to expand first on my opening sentence above in relation to this visit. We finished our visit by heading into the spectacular addition to the museum that houses the Eugene and Clare Thaw Collection of American Indian Art, considered to be one of the finest collection of Native American art in this country. It’s pretty amazing that this group was only assembled since 1988. The Thaws were committed to finding work that best represented the artistry in Native American objects based on their philosophy that the aesthetic power of American Indian art is equivalent to that from any culture. This has resulted in a collection that is not home to a few masterpieces set among some other lovely but typical pieces. No, it is a collection of masterpieces. 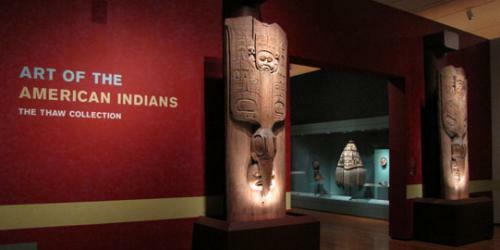 To give you an idea of the strength of this collection, there is a traveling exhibition from the collection that has been wowing museum goers in Cleveland, Milwaukee and Dallas museums and is set to open in Indianapolis on December 2. It has 111 pieces from the collection and has earned rave reviews from critics for the sublime nature of the collected pieces. Yet, you would never know anything was gone when you go through the collection on display at the Fenimore. We went from display to display, our mouths open with wonder, the superlatives coming from us seeming so insufficient after a while. Perhaps the highlight of their collection is the basket shown above, the famed Beacon Lights basket made by Washoe basketmaker Louisa Keyser, Dat So La Lee in her native language. 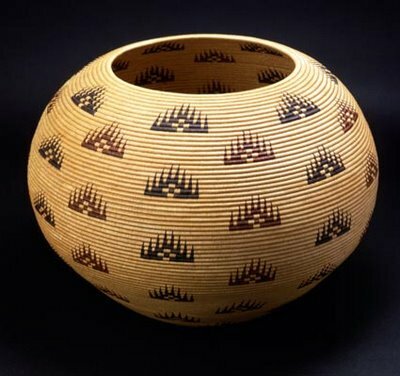 It is considered a treasure of American Indian art, called for the many years the most famous basket in the world. It took Keyser 14 months to weave this masterwork and when it was first sold in 1915 it brought a price of around $1500, a small fortune in that day and a sum that drew headlines for the basket. It is constructed of willow strips that run in horizontal bands around the basket held together with tiny willow strings that are woven vertically. The threadwork is extraordinarily fine. Most of the finest baskets of this sort have 27 strands per inch, or so I am told. This basket has 30. But beyond the sheer craft, it is the form that takes your breath away. It is as pure and graceful a form as you will ever witness. Anywhere, in any culture. There are so many examples beyond this spectacular basket that I cannot even begin to start detailing them. If you’re in Indy, take the time to examine that slice of this collected masterpieces. Even better, take a trip to the beautiful village of Cooperstown and be prepared to have your breath taken away. I know that I left the museum with the thought that started this blogpost ringing in my head. Beauty translates. Seeing this collection made me appreciate so much more the opportunity I have in communicating with my own work, this chance to create a visual language that goes beyond my own limited spoken and written range, beyond the confines of ones own culture. The opportunity to speak to the universal nature of the human spirit. The work in the Thaw Collection certainly does that.